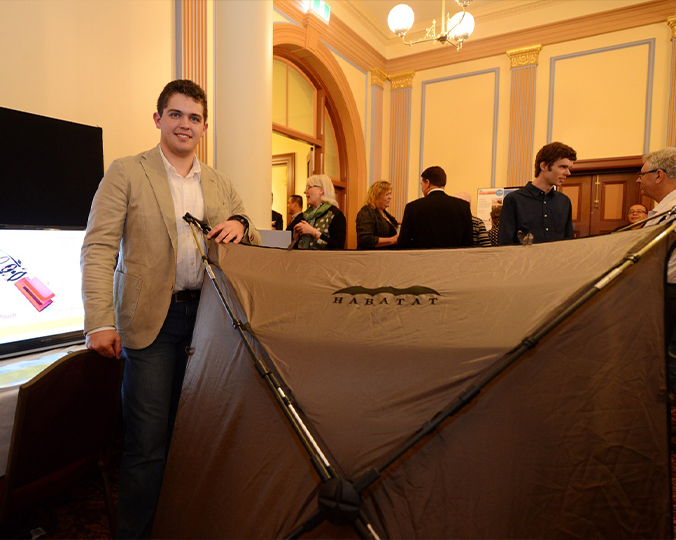 Danyon Boyd from Bundeena NSW took out the 2015 Bendigo Inventor Awards $10,000 prize with his Habitat Community Starter Kit.Natural disasters occur all year round on a regular basis leaving many people homeless and vulnerable. Danyon Boyd from Bundeena NSW took out the 2015 Bendigo Inventor Awards $10,000 prize with his Habitat Community Starter Kit. Natural disasters occur all year round on a regular basis leaving many people homeless and vulnerable. When such an event occurs, hospitals in the affected region become chaotic and those left homeless require basic human needs, such as water and shelter, to survive. Danyon Boyd, at the time a third year Industrial Design student at UNSW Built Environment, designed an emergency response product called Habatat CSK, that reduces chaos, aids coordination and rapidly responds to the needs of victims affected by natural disasters. The Habatat CSK, (named Ha-bat-at due to its resemblance of a bat hanging in a tree when closed, a bat with wings spread when open and its function as a habitat) is a community starter kit that can be set up to provide shelter and water to disaster refugee camps and makeshift hospitals. Each unit can accommodate and hydrate 16 occupants. In addition to providing 4 x 4 man shelters, the Habatat CSK can be configured in many ways to create central community spaces where clean rain water can be collected. This central space provides and encourages victims to come together and engage with their community to recover physically and emotionally.